Security forces also arrest 17 terrorists, allow 500 Jews to pray at Joseph's Tomb. The IDF and Border Police on Tuesday night arrested seventeen wanted terrorists in Judea and Samaria. Thirteen of those arrested are suspected of involvement in lone wolf terror attacks, disturbing the peace, and acts of violence towards civilians and security forces. 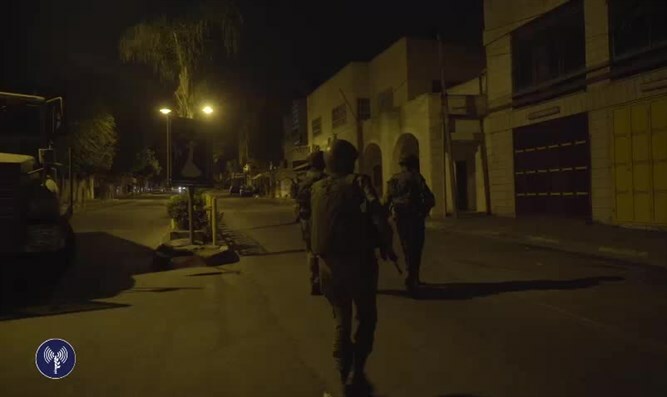 An additional arrest was that of another Palestinian Arab woman from Nawi Salah, who is suspected of involvement in an attack on an IDF officer and soldier last Friday. The incident is considered to have been an attempt to provoke a violent reaction, but the soldiers' controlled response prevented further escalation.. The suspects have been transferred for interrogation. Separately, the IDF and Border Police on Tuesday night secured the entrance to Joseph's Tomb in Shechem (Nablus), allowing 500 Jews to pray at the site. While the Jews prayed, Palestinian Arabs violently began to riot, burning tires and throwing rocks at the security forces, who responded with crowd dispersal techniques, firing shots into the air. "We are investigating the claim that three Palestinians were injured," an IDF spokesman said. Minister of Culture Miri Regev, speaking on Galei Yisrael radio this morning, criticized the delay in arresting all the women who attacked the soldiers, praising the soldiers' self-control, but insisting that arrests should have been immediate and not three days later.